When Cincinnati Music Hall opened in 1878, excitement was heightened by the unveiling of the new Hook & Hastings organ. 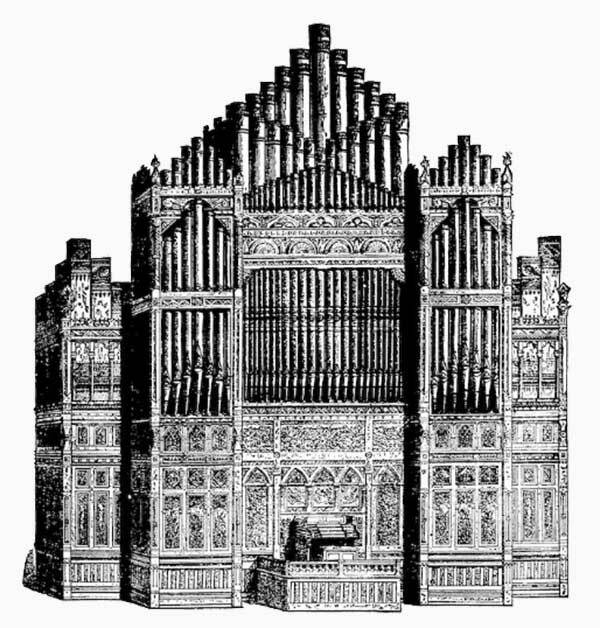 Called simply "The Cincinnati Organ," it cost $32,695 and had 6,237 pipes. This magnificent organ was huge—sixty feet high, fifty feet wide, and thirty feet deep. Only two organs in Europe were larger. The organ was installed at the western-most part of the auditorium. Reuben Springer had contributed a sizable amount of the total cost, with the rest of the funding provided by the community. Here was a glorious temple within which to enshrine the king of instruments. Not an earthquake. 'Twas the organ. With all the pipes contained in the organ, you would expect the sound to be powerful. The critic from the Chicago Tribune stated that, despite that expectation, "the full organ is comparatively weak." However, his review included praise for the individual stops and solo effects. He concluded that "a discriminative (sic) organist can produce a great variety of pleasing effects and render it exceedingly attractive." The organ provided great challenge to anyone who played it. The sound was so slow in coming that, during a fast tempo, the organist needed to anticipate the conductor by nearly a bar of music! The organ's casing contained 121 art-carved panels which were carved in Cincinnati by design school students and graduates - all women. There were two schools of design: one run by Benn Pitman; the other belonged to father and son woodcarvers Henry and William Fry. In 1901, the organ was overhauled and repairs were made, as needed. In the early 1920s, during renovation of Music Hall, the great organ was reconstructed by the Austin Organ Company. Of the original unit, only the case remained. By the late 1960s, the organ was in sad shape. The Music Hall Association looked at repairing it, but the cost was far more than replacing it with a more modern instrument. Then, as part of the multi-year renovation begun in the late 1960s, the Hook & Hastings organ was dismantled. Parts of the organ and the organ panels were either sold, gifted or stored away. A Baldwin Multi-Waveform (electric) organ was installed Music Hall in 1974. The Corbett Foundation financed the purchase and installation and the organ was dedicated by Cincinnati Symphony Orchestra music director Thomas Schippers. In the quote below, Mr. Springer references houses in the city in the late 1870s, where structures looked like they do now in Over-the-Rhine. "If our readers passing along the street will look for two houses side by side, each having a front of twenty-five feet, and about three stories in height, they will get an approximate idea of the size of the big organ."